We believe the human connection in IT is just as important to the system’s connection to the network. That’s why we created Match-IT. Match-IT personalizes your IT experience by bringing out the personality in our technicians and matching them to you. This delivers you the feeling of an intimate, small team with the benefits of a strong company behind you. You take a research-based personality and skills assessment to analyze your company and individual personality. We compare your test results to our technicians’ personality test results to determine the best personality and skill set matches. We build you an IT pod based on your test results. Your pod is a dedicated four to six person team that you can rely on for everything technology related. You will see the same technicians on site and talk to the same technicians on the phone. They will get to know your business like part of your team. Pegasus techs are incredible. They are IT professionals with personality. There isn't anything they can't figure out and fix - quickly, efficiently and with a smile. We don't know what we would do without them. Thank you! Tyler was very prompt and helpful! Very helpful at brainstorming what the problem might be and different ways to fix it. Matt was fantastic! Matt contacted me right away, and got me what I needed instantly! He was very kind, patient, and made me feel like I was a friend and not a customer or a number in a queue. Matt answered all of my questions and showed concern about my issue. Thank you, Matt and Pegasus! Tyler is the man. He is light years ahead of our last IT team. I have nothing but positive things to say about him. Thomas is an awesome tech. It’s great having the same tech come in every time because he knows our issues, our culture, and our people. Pegasus is always a pleasure to work with. They respond immediately and no matter how stupid our questions are they always make us feel like we have legitimate concerns. Thanks Pegasus!! Very professional and timely. Resolved my problems no matter how big or small with the same urgently and professionalism. Kudos to Pegasus. In the time it took me to get a cup of coffee from the break room the tech from Pegasus Technologies had done everything necessary to my computer and it was ready for me to use. Stephen is always a pleasure to work with and today was no exception! IT is such an important part of a business, so it’s huge to get the right people on your team. I appreciate that the Pegasus Team has worked with us to build the team of techs right for our account. The technicians that come into the office are so accommodating and professional. Who could ask for anything better? We pair you with a dedicated team of technicians matched to your personality and technical needs. Match-IT means your techs are aware of your unique problems and how to solve them. You never get a random IT tech showing up that doesn’t know your business. Works directly with you to establish your goals and vision. Learns your IT system inside and out to handle all of your technology issues. Two to three techs help solve your day-to-day technology problems. 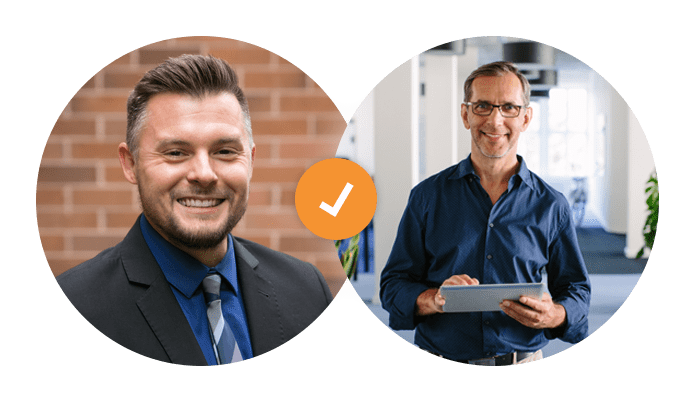 As part of our Match-IT service, you have immediate access to a Senior Technical Consultant for additional robust support, the Pegasus Help Desk, and a Central Dispatch contact that will put you in contact with the right member of your team.